Malaysia with its capital Kuala Lumpur is located in Asia (Southeastern Asia, peninsula bordering Thailand and northern one-third of the island of Borneo). It covers some 329,848 square kilometers (slightly larger than New Mexico) with a population of 31,382,000. Malay, English, Chinese, Tamil, Telugu, Malayalam, Panjabi and Thai are some of the languages spoken by the majority in Malaysia (consider regional differences). Brunei, Indonesia and Thailand are bordering countries. Malaysia is a country in Southeast Asia, located partly on a peninsula of the Asian mainland and partly on the northern third of the island of Borneo. Malaysia is a mix of the modern world and a developing nation. With its investment in the high technology industries and moderate oil wealth, it has become a rich nation in Southeast Asia. Malaysia, for most visitors, presents a happy mix: there is high-tech infrastructure and things generally work well and more or less on schedule, but prices remain more reasonable than, say, Singapore. The terrain is coastal plains rising to hills and mountains. The average density of population is about 95 per km². The climate in Malaysia can be described as tropical with annual southwest (April to October) and northeast (October to February) monsoons. Possible natural disasters include flooding, forest fires and landslides. To reach someone Malaysia dial +60 prior to a number. The local cellular networks are operated on 900 MHz, 1800 MHz, 3G, 4G. Websites typically end with the top level domain ".my". If you want to bring electric appliances (e.g. battery chaarger), keep in min the local 240 V - 50 Hz (plugs: G). The sign for the locally used currency Ringgit is MYR. 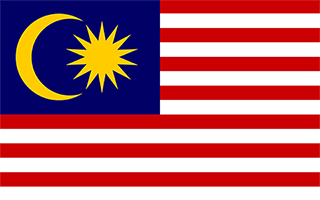 14 equal horizontal stripes of red (top) alternating with white (bottom); there is a dark blue rectangle in the upper hoist-side corner bearing a yellow crescent and a yellow 14-pointed star; the flag is often referred to as Jalur Gemilang (Stripes of Glory); the 14 stripes stand for the equal status in the federation of the 13 member states and the federal government; the 14 points on the star represent the unity between these entities; the crescent is a traditional symbol of Islam; blue symbolizes the unity of the Malay people and yellow is the royal color of Malay rulers.